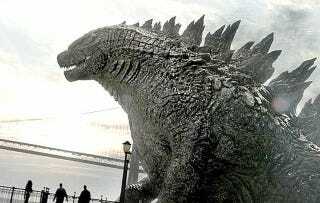 Hollywood's latest take on Godzilla is hitting theaters next month, and while we've already heard some of Japan's response to the new and improved giant city-destroying monster, that was before they got a full picture. So what do they think of him now? From Japan's largest internet forum, 2ch, while some think positively of the new design, the overwhelming response is that the king of monsters has been hitting the twinkies a little hard in his off time. His neck looks like an American football athlete's. Is this Sin from Final Fantasy X? That's what happens when all you do is eat and lay around. While the commenters are piling it on a little harsh about Zilla's figure, Matt Frank, artist for IDW's Godzilla: Rulers of Earth comic and long-time kaiju fanatic, had a counter-argument on the big guy's size. Said Frank, "It's a little ridiculous for anyone in Japan to complain that 'the American Godzilla is fat' - after all, he definitely had a heavy phase in the Heisei Era...."
I guess we'll be able to pass final judgment when the new Godzilla movie hits theaters on May 16th.